Recycling your computer(s) at California Electronics Recycler is a sure way to eliminate the risk of having your data information breached. We understand that computers contain all kinds of precious data and information that needs to be destroyed for your protection. We offer free Secure Data Destruction for every computer that is recycled through our Southern California facility. If you have several computers that are in need of recycling call us immediately at (800) 282-3927 or fill out our Contact form for more information, you may qualify for a Free Pickup. We ensure that all the computers, PCs, and laptops that we receive have their hard drives removed and securely wiped clean to prevent any confidential or private data from being exposed. We wipe hard drives and data through our DOD compliant Wiping Software, which is, guaranteed to destroy any data left on your device and make it impossible to recover. After hard drive removal and data destruction we sort through the computers components and re-purpose what is useful. If the components are too outdated we send them to our R2 down-line for complete scrap disposal. Why is Computer Re-Use Beneficial? The production of a PC requires 48 pounds of toxic chemical, 63 gallons of fossil fuels and 396 gallons of water. 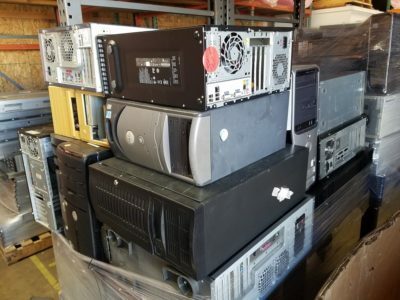 At California Electronics Recycler we do more to re-purpose electronics than any other electronics “recycling” company, because rather than just recovering the raw materials we first attempt to repair, re-sell, and donate items. We reduce the need for new manufacturing of electronics by giving longer life to used equipment. We resort to recycling as our last option, and when recycling we assure that it is done the right way. You make a difference, a big difference, one item at a time. R2 certified recyclers that test equipment diverted for reuse, and confirm key functions of the unit are working and may export this equipment. Without such testing and confirmation, such equipment must be treated as though it is going to recycling and may not be exported unless the R2 exporting provisions for recycling are satisfied. Understanding that some clients would not want their equipment remarketed or reused, R2 Practices require recyclers to have systems in place to ensure that all equipment can be recycled, rather than recovered for reuse, if the client wishes. Data destruction processes are periodically reviewed and validated by an independent party. An estimated 65 million tons of electronic waste is generated Worldwide each year. With a projected 23% electronics growth / consumption by the year 2017, an estimate $10 – 15 billion in electronic e-waste will be recycled each year. As electronics become commonplace in third World countries, these numbers are expected to soar. Ethical recycling of electronic waste will become a requirement to safeguard our environment and stretch our resources. Computer monitors, LCD monitors, older CRT monitors, computers, servers, and printed circuit boards all contain valuable yet harmful compounds. Electronics recycled ethically helps to mitigate the impact on the environment and lower the energy demand of harvesting virgin resources. Computer recycling, industrial equipment recycling, and CRT / LCD recycling at California Electronics Recycler follows strict environmental guidelines to ensure the environment is protected.